Paper trading is the act of planning entries and exits without spending real money. New traders or traders who wish to test out new indicators are well advised to start with paper trading. 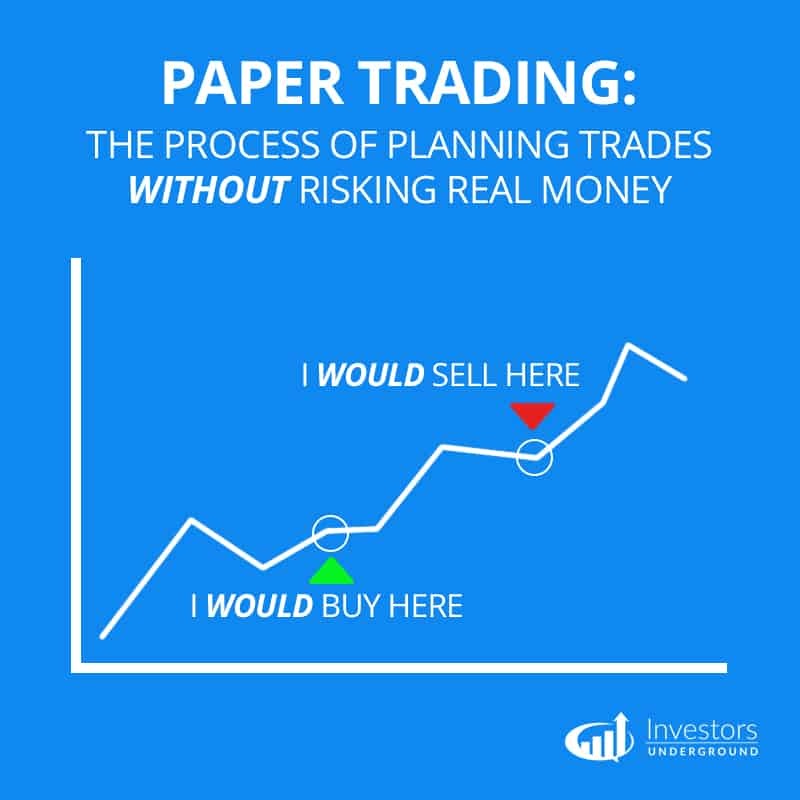 Paper trading is the simulating of real trades on paper or with paper money. Seasoned traders with over a decade of experience understood paper trading as taking simulated trades in a notebook, meticulously jotting down buy or sell orders they would normally place with a broker. Traders would try to be as accurate as possible, jotting on the time, size and price of a trade they would make. Once in a position, the trader would monitor and manage the position until it was closed. Usually, the results would fare much better than reality, as the traders soon discovered once they go live with real money at stake. Thanks to technological improvements in trading platforms, most online trading platforms offer a simulator to perform paper trading. In this case, paper refers to the money. The simulators now provide real-time quotes and executions based on live market data. Paper or simulator trading can help develop skill sets and solid trading habits, if done properly. Traders should be fully aware that paper trading results should not be considered remotely close to reality. It is simply a tune-up to prepare for real money trading. The goal of paper trading is to focus on spotting and reacting to technical trade set-ups. Measuring progress should not be based on how much profit is made but on the accuracy of the trades and winning percentages. Accuracy and consistency is attained through proper repetition of solid techniques through every market-trading climate. Paper trading can help train your eye to spot set-ups quicker and improve reaction speeds in real-time. It also trains the trader to manage the trades. It takes the emotions and fear of loss out of the equation, thereby allowing the trader to focus solely on how the trade plays out. Once you are signed up with an online broker, download the demo software and proceed to set-up your charts and indicators. Treat it like a real trading account. You should practice trading a core basket of stocks with good volume and price movement that correlates with the S&P 500. The sample core basket as mentioned under the watch list can be used. Practice with just one or two set-ups until you are able to spot and trade them consistently. Try to maintain a 75% or more win rate. Don’t get over confident or build large size positions. Always keep in mind that the fills won’t be accurate with real money. However, there is a practice technique that should implemented right from the beginning to prepare for accommodating liquidity. The following is a sample routine solid routine and prudent habits to help become consistent and improve accuracy while paper trading. In order to get more realistic fills, practice placing bids for entries, rather than buying on the ask. Practice selling on the ask, when exiting long positions. If you are able to consistently provide liquidity, then it shows that you are becoming well prepared to deal with liquidity. More importantly, you become better adjusted to fills and improve your temperance to volatility. Buying on the bid and selling on the ask takes preparation, foresight and timing. It also earns ECN pass-through rebates since you are providing liquidity when trading real money. The most important benefit is that it helps to keep you from panicking or chasing entries and exits and improves you accuracy. This is the most important psychological roadblock to overcome when trading real cash. Instilling the habit of buying on the bid and selling on the ask will get your mindset in the right stance to deal with liquidity like a market maker. Paper trading allows one to test out their strategies and build up a foundation of trading skill sets, without risking any capital. Paper trading also helps a trader to adapt to trading new stocks that may have a much different trading rhythm and behavior than other stocks. For example, Tesla Motors (NASDAQ: TSLA) trading at $220 moves at a much quicker pace with a larger price range than EBAY (NASDAQ: EBAY) trading at $24. A new trader jumping into TSLA after trading EBAY is in for a rude awakening when the bids can evaporate – $0.70 in seconds, while the trader is used to an EBAY rhythm where a – $0.10 downtick is considered large. It also allows you to discover what style of trading best suits your temperament: intra-day scalper, intra-day swing trader, news traders, momentum trader, and or overnight/multi-day swing trader. Lastly, it helps to find holes or gaps on your trading system/methodology so that it can be calibrated and tweaked. Paper trading helps to acclimate the trader so that capital is not lost during the discovery process, which then allows you to actually follow the stock and not the profit/loss blotter. The biggest problem with paper trading is the unrealistic results. The order fills are usually too good and not realistic. Most simulators will apply the order fill based on the inside bid and offer, but that can be a bit optimistic. Understand that paper trading is used to practice and fortify your skill sets and methods before trading real money. You should never assume the paper money made during this period would equate to the same amount of profits with real money. 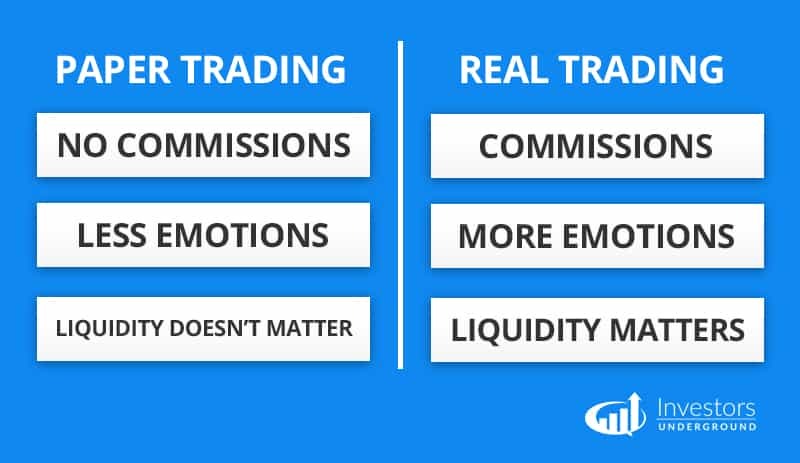 Although paper trading eliminates the emotional baggage and pressure that comes with trading real money and having skin in the game, the reality is that you will experience all the emotions and pressure once you start trading real money. The tension can be overwhelming to many traders and the results can be completely different between paper and cash trading. The issues of routing and liquidity can result in a lot of slippage when trading real money. The pressure of reacting quickly and walking the fine lines between conviction and stubbornness can be tantamount to being thrown in a lion cage with a piece of meat wrapped around you neck. The key is to build a comfort level with paper trading so that you can transition slowly into trading a real money account. This transition process is often where new traders screw up and get blindsided. Trading very light size during the transition and try to repeat the good habits that should have been instilled on the simulator. Repetition is the key.